It is time “to get your kicks” at the 66th Annual Oklahoma Cattlemen’s Association Convention and Trade Show. 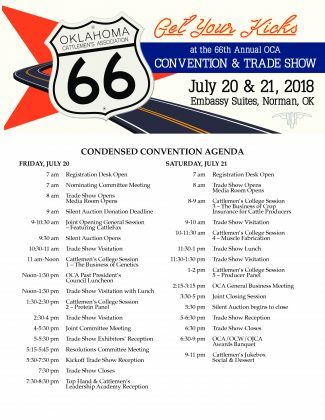 The informative event will take place July 20-21, 2018 the Embassy Suites in Norman, OK and Association Insurance Services will be in attendance. Both days will be filled with exciting events, educational speakers and of course a large tradeshow chock full of exhibitors waiting to assist clients. Below is a condensed agenda with a quick glimpse of all the OCA convention has to offer. In a continued partnership with the Oklahoma Cattlemen’s Association, Association Insurance Services Inc. (AIS) is excited to share information on the many insurance benefits offered to OCA members. Having worked with the OCA to provide affordable and attractive insurance options for many years, AIS is your insurance expert. OCA members have access to many options including health, dental (2 with hearing benefits) and vision plans, short-term medical, life insurance, Medicare supplements, cancer and accident policies, long-term care, and critical illness insurance. These plans are exclusive to members, and many are not offered elsewhere. They are specifically tailored to cattlemen and women, their way of life and their unique insurance needs. Many choices can be purchased separately or bundled. Specific policies can also be created for individual members or groups. Group insurance plans require 2 or more members and AIS works with groups of all sizes. AIS is proud of the many flexible packages and insurance options put forth for OCA members. They are happy to talk with members to help explain specifics, inform about options and work with individuals looking for something unique. Come find AIS on the convention tradeshow floor and learn more about how they can help you with all your insurance needs. Make sure you are informed and making the right choices for your family and business. Feel free to come armed with questions or simply stop by for a chat. AIS is always ready to help OCA members find the right benefits package for their needs. Please call 800-523-8351 for more information or to enroll and see you at the convention.